Brighten up your beach house with the Isla Tropics collection by C&F Enterprises. Sassy pink flamingos mingle against a colorful palm frond background. Pink, aqua, and lime scream summertime fun! For a more subtle look, reverse the quilt to a blue and lime stripe pattern. Use the white bedskirt to finish off the look without taking away from the fun bedding. The Isla Tropics collection features everything you need to finish your room, including a cute flamingo rug and window treatments. Mix and match the throw pillows to create your own custom look. Even better, the quilt is 100% cotton and machine washable, making it easy to care for. Made by C&F Enterprises. Tropical, fun, and a little sassy, the Isla Tropics Quilt Set is the perfect addition to your cottage by the sea. In a vibrant colorway comprised of aqua, lime, and pink, this bedding set features an allover palm leaf and flamingo print, sure to brighten up any room. Reverse to a blue and lime striped pattern for a more subtle look. Crafted of cotton, this bedding set is machine washable for easy care. 1 Twin Quilt and 1 Standard Sham, Measurements: Quilt 64" x 86"; Sham 20" x 26" , Hand Guided Vermicelli Stitching, Coordinating Accent Pillows, Euro Shams and Bed Skirt Available Separately, Face 100% Cotton, Fill Material Polyester/Cotton Blend, Machine Wash Cold, Line Dry, Imported. Made by C&F Enterprises. Tropical, fun, and a little sassy, the Isla Tropics Quilt Set is the perfect addition to your cottage by the sea. In a vibrant colorway comprised of aqua, lime, and pink, this bedding set features an allover palm leaf and flamingo print, sure to brighten up any room. Reverse to a blue and lime striped pattern for a more subtle look. Crafted of cotton, this bedding set is machine washable for easy care. 1 F/Q Quilt and 2 Standard Shams, Measurements: Quilt 90" x 92"; Sham 20" x 26" , Hand Guided Vermicelli Stitching, Coordinating Accent Pillows, Euro Shams and Bed Skirt Available Separately, Face 100% Cotton, Fill Material Polyester/Cotton Blend, Machine Wash Cold, Line Dry, Imported. Made by C&F Enterprises. Tropical, fun, and a little sassy, the Isla Tropics Quilt Set is the perfect addition to your cottage by the sea. 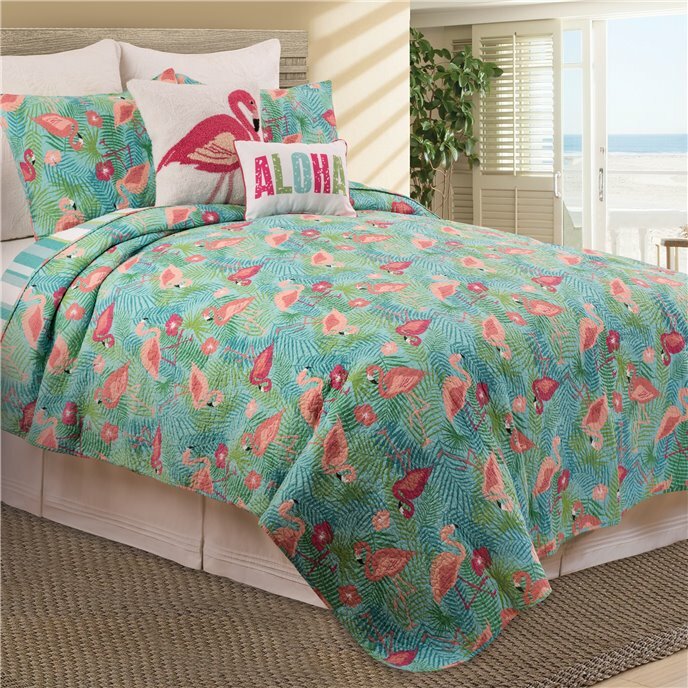 In a vibrant colorway comprised of aqua, lime, and pink, this bedding set features an allover palm leaf and flamingo print, sure to brighten up any room. Reverse to a blue and lime striped pattern for a more subtle look. Crafted of cotton, this bedding set is machine washable for easy care. 1 King Quilt and 2 King Shams, Measurements: Quilt 108" x 92"; Sham 20" x 36" , Hand Guided Vermicelli Stitching, Coordinating Accent Pillows, Euro Shams and Bed Skirt Available Separately, Face 100% Cotton, Fill Material Polyester/Cotton Blend, Machine Wash Cold, Line Dry, Imported. Made by C&F Enterprises. Treat yourself to a vacation in your own home with the Aloha Pillow. In a colorful tropical colorway, a printed Aloha motif greets guests in true Hawaiian fashion. Caring for this pillow is a breeze with a removable insert and convenient zipper closure for easy care. Measures 12" x 16", Contrasting Pink Piped Edge, Filled and Finished in USA, 100% Cotton Cover, Fill Material Polyester, Spot Clean, Imported. Made by C&F Enterprises. Brighten up any space with this Flamingo Hooked Pillow. A pink-on-white flamingo motif and unique hooked texture add an element of fun to your décor. Crafted of acrylic yarn on cotton canvas and secured with a zipper closure this pillow is suitable for any room in your home. Spot cleaning recommended. Measures 18" x 18", Clean Knife Edge Finish, Filled and Finished in USA, Acrylic Yarn on Cotton Canvas, Fill Material Polyester, Spot Clean, Imported. Made by C&F Enterprises. The Isla Tropics valance features a tropical pattern with palm fronds, graceful flamingos, and hibiscus flowers in a playful medley of coastal greens, blues, and pinks. Straight rod pocket valance. 15.5"H x 72"W. Unlined. We offer the complete ensemble in the Isla Tropics pattern by C & F.
The Isla Tropics Shower Curtain is a tropical favorite for the bath with palm fronds, graceful flamingos, and hibiscus flowers in a playful medley of coastal colors in a variety of shades of greens, blues, and pinks. 72" x 72". We offer the complete ensemble in the Isla Tropics pattern by C & F.
The Isla Tropics Flamingos Hooked Rug features a duo of two-toned pink flamingos facing each other, with green palm fronds on a blue background. 22" x 34". Acrylic. Coordinates with the Isla Tropics ensemble by C & F.